The Advanced Magnetic Resonance Center is shared by researchers at the Oklahoma Medical Research Foundation (OMRF) and the University of Oklahoma Health Sciences Center (OUHSC) primarily as well as other researchers in Oklahoma. Our biomedical research interests include, but are not limited to, cancer biology, neurological disorders and cardiovascular pathologies. 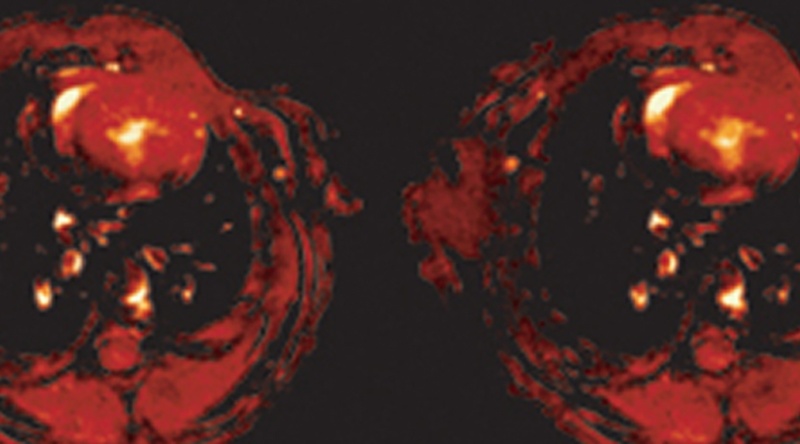 Our research target themes are addressed with techniques such as basic morphological MRI (e.g. T1, T2 imaging), dynamic contrast-enhanced MRI (DCE) to establish location and extent of pathological lesions, MR angiography (MRA) to visualize vascularization, functional MRI (fMRI) to monitor tissue/organ response given a challenge function, and MR spectroscopy (MRS) to follow metabolic changes during a disease processes. A particular strength of the facility is recent developments in the use of molecular targeting agents, which couple a MRI contrast agent (such as gadolinium complexes or ferromagnetic particles) with antibodies specific for cellular receptors or other antigens. This form of contrast enhanced imaging, allows in vivo visualization of molecular events. Many of the studies utilize transgenic murine models. The use of transgenic mice has dramatically advanced our ability to analyze and understand the molecular basis of various diseases. However, we are not limited to mice. Subjects up to approximately 20 cm in axial diameter may be imaged. The Oklahoma INBRE, OMRF COBRE, and OCAST (Oklahoma Center for the Advancement of Science and Technology) funding provides the facility with infrastructure funds for investigators to obtain in vivo non-invasive functional, morphological and molecular information on various disease models focusing on neurological diseases and cancer detection and therapeutic agent assessments, and cardiovascular disease.